Today’s Haaretz newspaper carries a story about a dispute that has arisen between archaeologist Eilat Mazar and Elad, the right-wing settler organization who years ago was given total control over the City of David “national park”. It has to do with a small excavation area now open in the street in front of the park entrance, work being carried out by the Israel Antiquities Authority in conjunction with Elad — and without Mazar’s direct involvement. She says it was planned in the dark without proper notice, that it impinges on her own earlier excavation area only a couple of meters to the east, and — perhaps her oddest argument — that the excavation area is too small. They say that Mazar was privy to the present plan long ago, had promised not to make a fuss about it, and in fact has (or was offered?) the status of consultant to the project. And so it goes… Elad, by the way, were the major funders of Mazar’s dig on the summit of the narrow City of David ridge which was completed in 2008. I myself saw this trench open one week ago. It had every appearance of being a “rescue” excavation, which it seemingly is, and contained both modern pipes and conduits as well as some obvious ancient remains. One very interesting aspect: The work seems to be connected to “Jeremiah’s Pit”, a large rock-hewn cistern that was discovered a few years ago (or maybe several by now) and was much in the news at the time. Because of its location, the space resonated strongly with the biblical story of the prophet Jeremiah being thrown down into the muddy pit, the response of royal officials to his public messages of doom and destruction (Jer. 38:6). The cistern was open to visitors (with a special guide) at one time, then just disappeared! My impression was that it was sealed and paved over; it would lie underneath the courtyard to the left as one enters the visitors’ center compound. Anyway, it seems as though the present work explores new areas of this space, including the removal of at least one built wall, with the aim of re-opening the cistern with expanded visitor access. The City of David excavation. The view is looking south on Ir David/ Wadi Hilweh Street. The entrance to the visitors center site is on the left, Haaretz photo, Olivier Fitoussi. Dr. Eilat Mazar, who worked in close cooperation with the group – which promotes the ‘Judaization’ of East Jerusalem – says excavations carried out in violation of accepted procedures. Mazar’s claims against Elad are being leveled at a crucial time as a proposed law to privatize public parks is being considered. 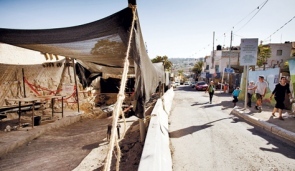 If approved, the bill will enable Elad, a private association which excavates, maintains and conducts tours of the City of David, to maintain control of the historic site – situated in the predominantly Arab village of Silwan, adjacent to the Old City. Attorney Boaz Fiel, representing Elad, noted in a letter that Mazar had signed a contract with the association, to the effect that she would not have “any claim or complaint against Elad regarding future excavations.” “In light of this clear and specific promise, how can we explain your present claim regarding any rights, as incomprehensible as they may be, to continue excavating at the site?” wrote Fiel. The lawyer added:”It is hard to avoid the impression that your letter is nothing but an attempt to stop legitimate and vital work being carried out by our client, for reasons of ego and credit only, camouflaged as pseudo-professional complaints.” Fiel threatened to take legal steps against Mazar. In the weekend newspapers Elad published large ads inviting the public to tour the new subterranean route that it has opened near the Western Wall complex. The ads were signed by the new public council of the association, headed by Nobel Peace Prize laureate Elie Wiesel. Why are we not surprised? According to a Haaretz story today, Israel’s National Parks Authority is teaming up with the Ministry of Tourism to bring a $1 million-plus sound and light show to the City of David. One of the highlights apparently will be “Jeremiah’s Cistern” — which its excavator, Ronny Reich (as mentioned above), insists dates from the Byzantine period, a thousand years later!. Oh, well… No need to let archaeology get in the way of a good story, eh? For more on the “Disneyland” mentality it seems is being imposed on some of Israel’s “national parks” (by people with a certain agenda), see HERE. NOTE: (1) Much of the content on the Haaretz site is now by subscription only. (2) I’m too cheap to subscribe. (3) If you are too, then you’ll have to make do with the headlines. Sorry. This entry was posted in City of David, Issues in Archaeology, JERUSALEM, Jerusalem Antiquities and tagged Archaeology, City of David, Eilat Mazar, Elad, Jeremiah's Pit, Jerusalem, Ronnie Reich, Silwan. Bookmark the permalink.